Her spontaneous action surprised not only the WEF organisers but also the press. Instantly, the news travelled around the world that she had raised one million dollars for bednets in five minutes. Not quite. While many participants in the conference room made spontaneous pledges, barely a few finally kept their promises and only US$ 140,000 was raised . Unfortunately, Tanzania had already been told that one million dollars would be available and it had planned a free distribution campaign accordingly. In the end, it was UNICEF funds which made up the missing US$ 860,000, in effect heavily subsidising Stone’s publicity stunt. As a matter of fact, money was the least of the problems – the well-intended action caused quite some upheaval and fears in Tanzania that free bednets would threaten the fragile emerging supply chains that were just building up. 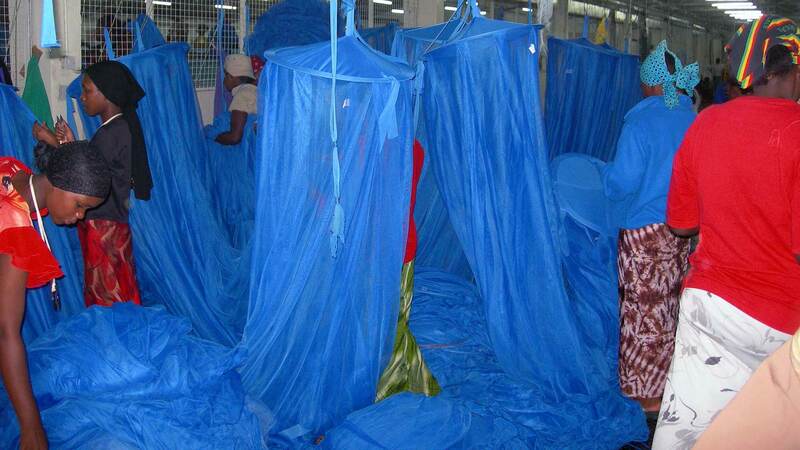 There was an immediate strong reaction from the local manufacturers of bednets: they were angry that they had invested not only in bednet production but also in a distribution network and now these free nets were flooding the market and undermining the private sector. If people were to get to know that they could get a net free, they would obviously stop buying them. However, there was also much to learn from this experience: it was decided to use the free bednets in only two areas, Lindi and Mtwara. As the free nets were targeted at vulnerable groups only, the programme learnt that free distribution is compatible with a private supply chain approach, provided the free distribution remains targeted. There are some daunting challenges ahead for catching-up the coverage of bednets fast. First of all, there is a need to accelerate coverage among the high-risk groups, much more rapidly and equitably. Following a very comprehensive strategy discussion among ITN stakeholders in 2007, it was decided to implement a mass campaign of free LLINs to all children under the age of five years in 2008 (7.2 million LLINs). This campaign will be supported by the GFATM (58%), the World Bank (37%) and the PMI (5%). At the same time, there will be a mass re-treatment of all existing polyester nets with a long-lasting insecticide, in fact converting many untreated nets to be LLINs for the rest of their life-span. Various upgrades of the TNVS are also planned, including raising the value of the voucher so that it covers a LLIN, and to reduce the top-up amount paid by pregnant women and mothers to only TZS 500 (US$ 0.44). As a result of these measures, coverage of children should exceed 80% by the end of 2008. A serious challenge in this catch-up campaign will be to leave the current supply chain intact. Fortunately, the experience with free net distribution in Lindi and Mtwara in 2005 (the ‘Sharon Stone nets’) indicates that both the commercial sector for nets and the voucher scheme are likely to survive the mass distribution, if given only to children. If free nets are targeted at vulnerable groups only, there may still be sufficient demand – or perhaps the free distribution may even act as a primer – to allow for private purchases.